Fortnite Creative has offered builders a way to showcase their skills without the constraints of a battle royale and with a whole bunch of extra tools. Naturally, that means we have plenty of recreations of famous film sets to look at, and today we’ve got an especially impressive recreation of Star Wars’ Millennium Falcon. This build of the Falcon comes courtesy of YouTuber MakaMakes. It’s an impressive one, complete down to the last detail on the exterior, and there’s a fully explorable interior, too. The cockpit gets the most love, but you’ll see plenty besides, like the lounge with Dejarik board. According to my copy of Star Wars: Incredible Cross Sections – which I naturally always keep close at hand – it’s a pretty accurate summation of the layout. MakaMakes has plenty of other goodies from the Star Wars universe for your perusal, ranging from classic Star Destroyers and AT-ATs to Republic Venators – plus items from Star Trek and Lord of the Rings besides. Epic did cut a deal with Disney to get Avengers content in Fortnite, so maybe Star Wars isn’t too far behind. In the absence of an official crossover, you can see the Millennium Falcon below, as brought to our attention by Dexerto. There’s plenty more on MakaMakes’ YouTube channel. 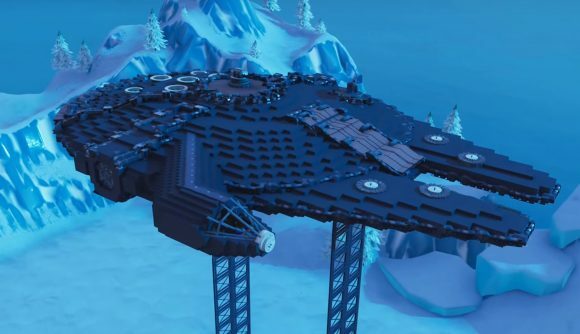 Check out the best Fortnite Creative codes if you’re looking for more places to explore directly – sadly, MakaMakes hasn’t yet been cleared to share codes for these creations.